There is everything to play for this season as teams compete not only to take home the coveted series title but also secure their ticket to Tokyo 2020 with the world series acting as principle route for Olympic qualification. 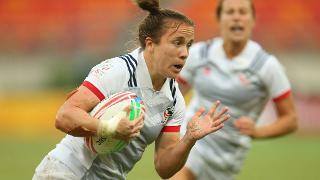 As the new season starts, 35 players across eight teams are set to make their series debuts at the HSBC USA Women’s Sevens, including invitational side Mexico who become the 23rd nation to play on the women’s series. In Pool A series champions Australia will be looking to retain their title as they face Russia and Spain, who placed sixth and seventh respectively last season, and newcomers Mexico. Pool B features recent Rugby World Cup Sevens champions New Zealand alongside hosts USA, a new-look England side that features five series debutants, including former 15s player Ellie Kildunne, and new core team China. Rugby World Cup Sevens silver medallists France head Pool C and will face Canada, who finished fourth last season, an unchanged Ireland side and Fiji, who have named four rookie players including captain Sereima Leweniqila. The action gets underway at 10:30 local time on Saturday (GMT-6) with Canada taking on Fiji.